Finally. The post you all have been waiting for, literally my most requested post ever. 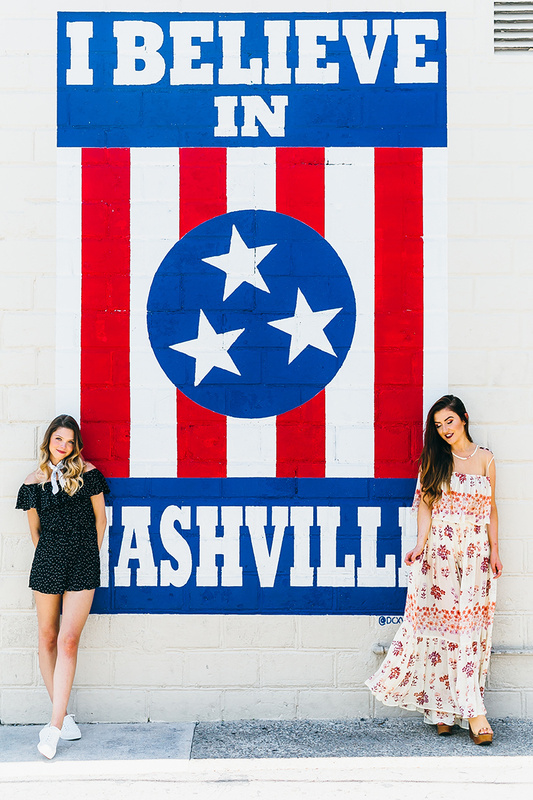 I am so excited to finally bring you guys The Ultimate Nashville Guide for your weekend adventure to Nashville. Nashville is becoming one of the biggest tourist destinations in the US and I am so blessed to live in such an amazing city. I have so many other guides for Nashville coming your way, but in the meantime, I felt like it was important to bring you guys this post first. Also I wanted to let you guys know that about two months ago, I did a shoot with an amazing, recently launched site called Ciao Collective. They launched their own Nashville Guide, so if you want to check that out, I've linked it here. They mention a lot of places that I didn't have enough time to mention for this specific post. I'm doing a giveaway collaboration with them on my Instagram with a few other ladies, so be sure to go enter there too! And for those asking about the set I'm wearing in this picture, it's from Free People and I'll have it linked here! I am a big advocate for Airbnb, whenever I would visit, I would rent an apartment on there for the weekend in East Nashville. If you're flying in, be sure to rent a car, it'll be a lot easier to get around with a rental than an Uber. You can use my link for a $20 Airbnb credit, or for a free ride on Uber, use UBERSARAHBELLE. If you're lucky enough and have a little extra money in your pocket, I recommend either staying at the Urban Cowboy (book a few months in advance and also I have a post coming up next month about this amazing place) or the Thompson Hotel in the Gulch. Head to The Pharmacy in East Nashville for the best cheeseburgers in town. 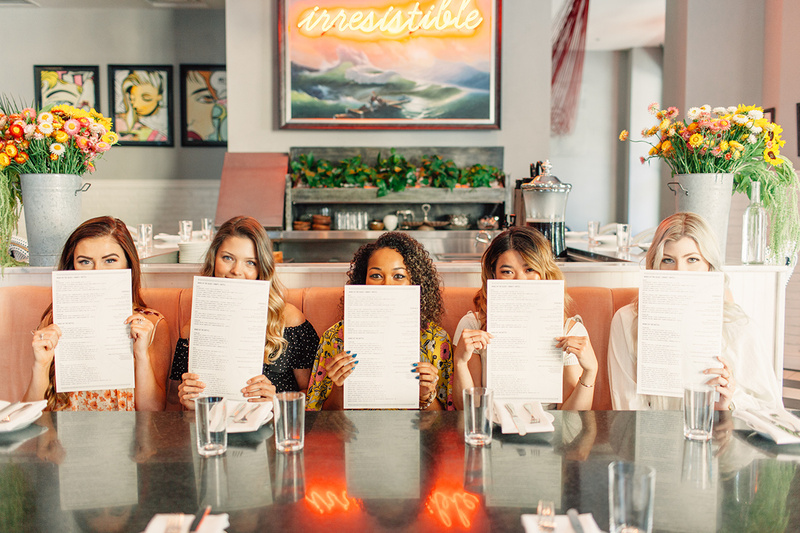 You will not regret anything on the menu, especially if you love potatoes as much as me because they have sweet potato fries, tater tots and traditional fries. My mouth is watering while I write this. Pro tip: Go to The Pharmacy on Yelp and see that there is a waitlist that tells you how long the wait is and you can add your name to the list. It's the closest thing to a reservation and that way you won't be waiting outside long because there is always a wait. Get your Instagram on! After you stuff your belly, head to one of the few amazing murals in East Nashville. I give the exact locations of my favorite ones in my Top Murals in Nashville post here! Pro Tip: Stop by Old Made Good in East Nashville for unique souvenirs. I love this store, so many vintage finds and just overall adorable aesthetic. Then head to Pinewood Social right across the river within walking distance of downtown bars and Honky Tonks. Pray for a sunny day so you can sit outside on their patio, play some games, socialize all while drinking their amazing frosé. Even if it's raining, you might be able to reserve one of their bowling alley lanes. Who doesn't love bowling?! Once your done at Pinewood, start to head downtown and if you want to kill some time (or maybe you want to kill some of the calories you just ate and drank) walk the Pedestrian Bridge with the entrance ramp on 3rd St. You will get an amazing view of downtown Nashville and not to mention, a great photo opp. After that, head to the souvenir stores all along Broadway and pick up a comfy sweatshirt. I have no shame, I did this and so did Caitlin when we visited Nashville the first time. No regrets. For dinner, go to The Stillery because I know you will dying to see what this Broadway experience is all about. Located right off Broadway on 2nd, you will die over everything on the menu. I recommend getting the Hot Chicken Mac & Cheese. It's as delicious as it sounds. Carb up before a night of drinking. Pro tip: Put your name in at the hostess and then spend the wait time wandering around Broadway or go to the 2nd floor and get some of their delicious mason jar drinks. Time to see what Nashville, TN has to offer in the infamous Broadway honky tonk region. Even if you don't like country music, you will enjoy your time here. It's an overall fun atmosphere and theres so many different bars to choose from. Start at Acme Feed & Seed and go to the rooftop bar. If you don't like country music, this is the place for you plus you can't beat the view overlooking all of Broadway. Once you feel the buzz and are ready to take on the "real" Broadway experience, head on down to Honky Tonk Central. Off Broadway is a fun bar called HQ that has a bunch of old arcade games. Also a very fun atmosphere to drink and play some games at. Drunk Tip: Definitely take pictures in the Photo Booth there to laugh at the next morning. Drunchie Tip: If you've got the itch for some late night, drunk food, The Diner downtown is open 24/7. Odds are you may be hungover so go to 12 South for either donuts from Five Daughters Bakery, an acai bowl from Franklin Juice Co or eat your weight in a delicious breakfast at the Frothy Monkey. Since you're on 12 South, go embrace your basicness and take a picture infront of the many murals here. I'll link the post for my favorite murals here again. Walk around, enjoy the sunshine and stumble into the many boutiques this area has to offer. My favorite boutique in this area is Cadeau Nashville. Hop in your car and head down 12 South to the Gulch area and explore what they have to offer in the Gulch. It's one of my favorite neighborhoods in Nashville personally because of all the greatness it has to offer. Definitely shop around there. There is a decent size Urban Outfitters there and this adorable store called Two Old Hippies right next door that you have to stop in. If you can't find the Amelia Flower Truck in 12 South, you will probably find in the Gulch. A cute photo opp and if you're a man, a great place to buy your woman something nice. The Gulch also has amazing places to drink at. The bar I recommend the most is on top of the Thompson Hotel called LA Jackson. It's a little pricey but worth it for the view you get. Or if you're an avid beer drinker, Yazoo Brewery is located in the Gulch too. I love Yazoo, they have amazing sour beers there. My mouth is watering just thinking about it to be honest. There are so many great options to eat for dinner that I don't want to tell you just one place to go, but for the sake of this blog post not being a novel, I have to so, if you want to try the traditional, famous Nashville Hot Chicken, definitely go to Hattie B's. If you're feeling adventurous, try their banana pudding and report back to me because I love banana pudding but have yet to try theirs. Pro Tip: If you have the luxury of having a rental car or easy way to get around, I recommend ordering your meal on Hattie B's website for pick up to avoid the forever long lines on the weekend. It can get crazy but usually your order is ready in 30 minutes for pick up. Take it back to the hotel or Airbnb and get ready for the night! Midtown has some really fun bars too and if you're going out of a GNO, I recommend going to South. I left my dignity on the dance floor last time I was there, but it was so much fun! If you're not heading out for a GNO and decide to let the BF tag along, hit up Kung Fu Saloon. It's another one of those arcade bars but also is a lot bigger than the one I recommended downtown. It's a fun time! I am about to reveal my biggest secret of this entire blog post... my go-to, no-wait, brunch restaurant only on Sundays... Go to Tenn 16 at Five Points in East Nashville. Holy Yum. You will not regret this. I get the hot chicken biscuits with the hash brown casserole and you truly earn the food baby here. They also have a frosé here that I am dying to try. It's also a great place for dinner, although I've never been for dinner yet. Pro Tip: The bear mural I adore in Nashville is right across the street from Tenn 16. You're welcome. I mean, what kind of Nashville Guide would this be if I didn't tell you guys to go to my favorite antique mall?! Go to the Downtown Antique Mall on 8th and explore all the antique goodness this city has to offer. Also they have candy there for purchase, like Tootsie Pops, so bring change. I know this makes me sound 5, it's cool. If you want to continue your antiquing adventures, I'm posting a Nashville Antique Mall guide here soon, so keep checking back. Ice Cream time! I obviously have to tell you guys to go get some ice cream before embarking on your journey homeward bound. The Soda Parlor in East Nashville is SO cool and unique. I think it would be the perfect way to end your amazing weekend vacation. So there you have it. Your 72 hours in Nashville, TN from a Nashville resident. Have you been to Nashville before or are you coming to visit for the first time?! What are you the most excited for? Let me know in the comments below. 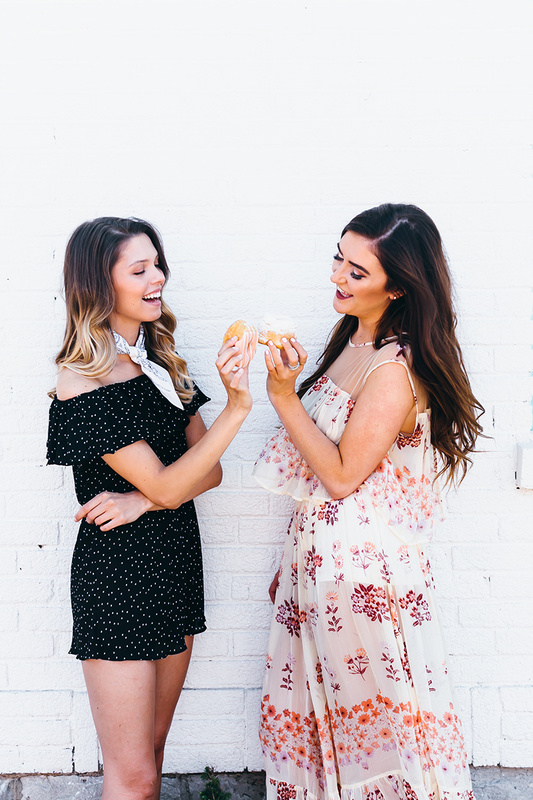 If you're interested in my other guides for Nashville, check them out here! Don't forget to share the image below on Pinterest and save it to your board to insure you always have this guide to look back on. Sarah! This post is everything. My boyfriend has lived in Nashville for the past 2 years and I visit whenever I can! You should definitely do some meetups in the off chance I get to meet you! 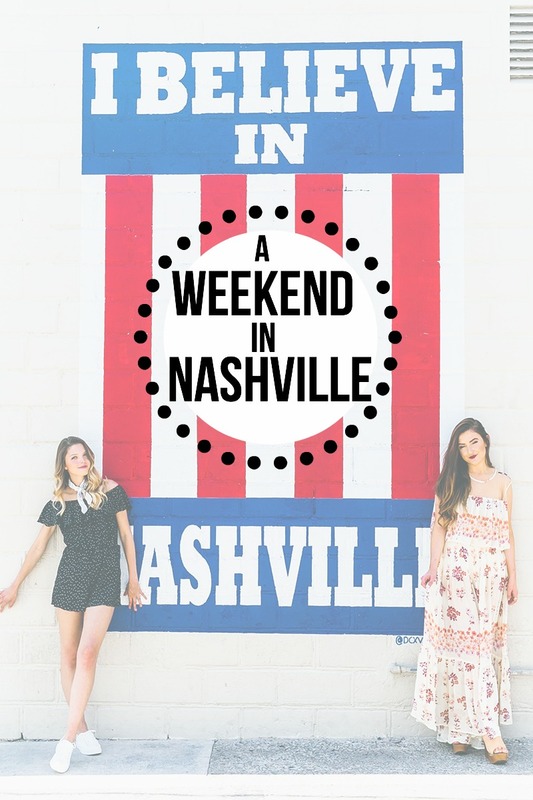 But this guide to a weekend in Nashville is SPOT ON! I love every place you mentioned. Way to go girl! I loved this! You hit some great spots in my hometown. :) You should check out "The Flip Side" on 12 South (They specialize in Chicken Parmesan in basically every way imaginable), and Barista Parlor in either East Nashville or the Gulch. Love this guide! I loved visiting Nashville a couple years back-can't wait to go again and see some of the places on your list! This guide is perfect! If you go to pharmacy at an earlier time, around 5-6 PM, you'll for sure get seated. 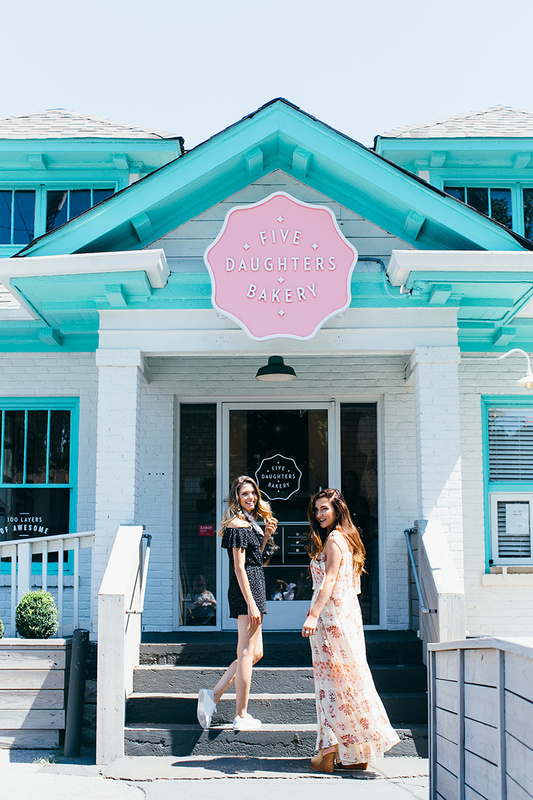 Five Daughters Bakery is definitely a favorite, their maple glaze flavor is sinful! Beautiful place to visit, Thanks for sharing nashville travel experience with us do you know Nashville hosts Tin Pan South, the largest songwriter’s festival in the world. book now Golden Triangle Tour With Ranthambhore tour package and enjoy this amazing journey.